Noun. Colloquial (usually derogatory). Mid-19th century. The lexicographers seem a little bit unsure about bint. While the OED says that it is usually derogatory, the online Collins dictionary unequivocally brands it as derogatory and offensive. Merriam-Webster makes no mention whatsoever of its level of offensiveness, while my copy of Chambers states diplomatically that bint has "various shades of meaning". Regardless of whether it's derogatory or not (and I think it is), bint is an interesting word when considering Britain's colonial history and its influence on the English language. Being Arabic for daughter, bint was evidently adopted by British troops serving in the Middle East (particularly Egypt) as slang for 'a girlfriend'. Its use continued through the World Wars and it's still used and understood in various parts of Britain today, though often having lost the connotation of a 'a girlfriend' and just being used to mean a girl or woman. To illustrate the word and it's use, I've included a scene from Monty Python and the Holy Grail, in which a peasant uses bint to refer to the Lady of the Lake. 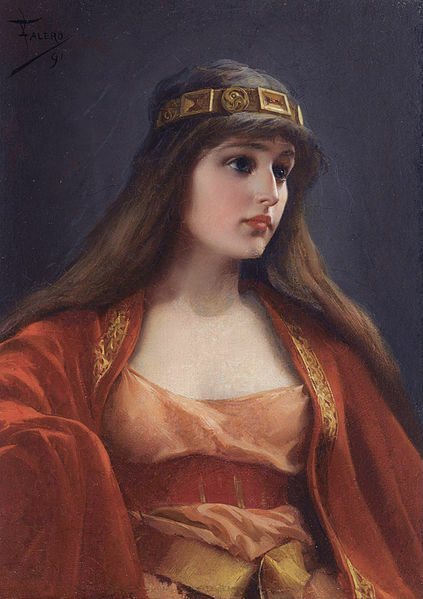 For the picture, I chose Luis Ricardo Falero's beautiful painting of a Bedouin girl, who may not be a bint in the coarse English sense, but is a bint in the original (and infinitely more noble) Arabic sense. I must confess it feels strange to be mixing the coarse with the refined, but then that's what language does. If you're familiar with the word bint, or have any thoughts on it, please do comment in the box below. The lady of the lake was the first thing I thought of. The last thing I'd call that girl in the painting is a bint. Neither would I, but assuming that she's from an Arabic-speaking Bedouin family, her father would have. It's not a word I've heard for a long time. It was always used in a slangy sense and never complimentary. What a shame we warp the meanings of such wonderful words! For me, it's one of those funny words that I understand, but I can't ever remember it being used by anyone I know, ever.